16 December 2015: Astronomers using the Atacama Large Millimeter/submillimeter Array (ALMA) have found the clearest indications yet that planets with masses several times that of Jupiter have recently formed in the discs of gas and dust around four young stars. Measurements of the gas around the stars also provide additional clues about the properties of those planets. 9 December 2015: The spectacular aftermath of a 360 million year old cosmic collision is revealed in great detail in new images from ESO’s Very Large Telescope at the Paranal Observatory. 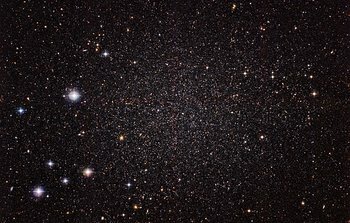 Among the debris is a rare and mysterious young dwarf galaxy. This galaxy is providing astronomers with an excellent opportunity to learn more about similar galaxies that are expected to be common in the early Universe, but are normally too faint and distant to be observed by current telescopes. 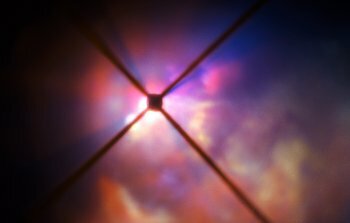 25 November 2015: A team of astronomers using ESO’s Very Large Telescope (VLT) has captured the most detailed images ever of the hypergiant star VY Canis Majoris. These observations show how the unexpectedly large size of the particles of dust surrounding the star enable it to lose an enormous amount of mass as it begins to die. This process, understood now for the first time, is necessary to prepare such gigantic stars to meet explosive demises as supernovae. 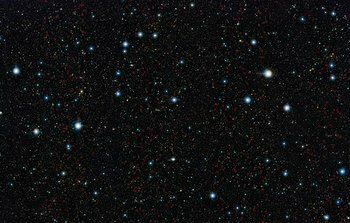 18 November 2015: ESO’s VISTA survey telescope has spied a horde of previously hidden massive galaxies that existed when the Universe was in its infancy. By discovering and studying more of these galaxies than ever before, astronomers have, for the first time, found out exactly when such monster galaxies first appeared. 11 November 2015: The remains of a fatal interaction between a dead star and its asteroid supper have been studied in detail for the first time by an international team of astronomers using the Very Large Telescope at ESO’s Paranal Observatory in Chile. This gives a glimpse of the far-future fate of the Solar System. 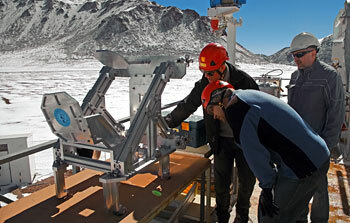 4 November 2015: A new instrument attached to the 12-metre Atacama Pathfinder Experiment (APEX) telescope at 5000 metres above sea level in the Chilean Andes is opening up a previously unexplored window on the Universe. The Swedish–ESO PI receiver for APEX (SEPIA) will detect the faint signals from water and other molecules within the Milky Way, other nearby galaxies and the early Universe. 28 October 2015: Astronomers using the VISTA telescope at ESO’s Paranal Observatory have discovered a previously unknown component of the Milky Way. 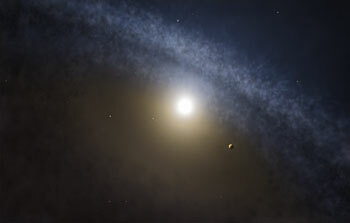 By mapping out the locations of a class of stars that vary in brightness called Cepheids, a disc of young stars buried behind thick dust clouds in the central bulge has been found. 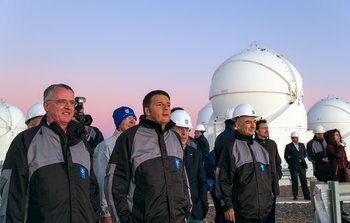 26 October 2015: On 24 October 2015, the Prime Minister of Italy, His Excellency Matteo Renzi, visited ESO’s Paranal Observatory in the Atacama Desert of northern Chile. He was taken on a tour of ESO’s world-leading astronomical facilities by ESO’s Director General, Professor Tim de Zeeuw, and the Programme Manager of the European Extremely Large Telescope (E-ELT), Roberto Tamai. 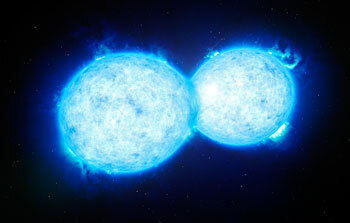 21 October 2015: Using ESO’s Very Large Telescope, an international team of astronomers have found the hottest and most massive double star with components so close that they touch each other. The two stars in the extreme system VFTS 352 could be heading for a dramatic end, during which the two stars either coalesce to create a single giant star, or form a binary black hole. 14 October 2015: Dark smudges almost block out a rich star field in this new image captured by the Wide Field Imager camera, installed on the MPG/ESO 2.2-metre telescope at ESO’s La Silla Observatory in Chile. 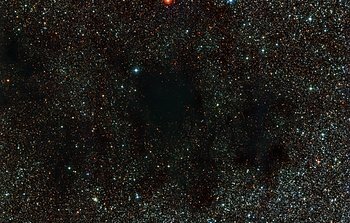 The inky areas are small parts of a huge dark nebula known as the Coalsack, one of the most prominent objects of its kind visible to the unaided eye. Millions of years from now, chunks of the Coalsack will ignite, rather like its fossil fuel namesake, with the glow of many young stars. 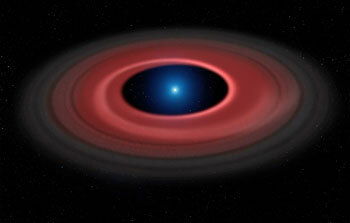 7 October 2015: Using images from ESO’s Very Large Telescope and the NASA/ESA Hubble Space Telescope, astronomers have discovered never-before-seen structures within a dusty disc surrounding a nearby star. 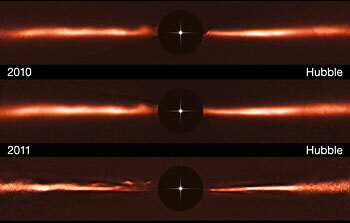 The fast-moving wave-like features in the disc of the star AU Microscopii are unlike anything ever observed, or even predicted, before now. The origin and nature of these features present a new mystery for astronomers to explore. The results are published in the journal Nature on 8 October 2015. 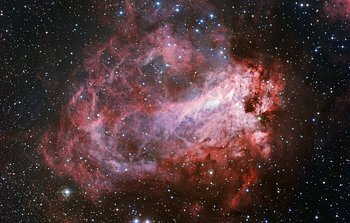 23 September 2015: This new image of the rose-coloured star forming region Messier 17 was captured by the Wide Field Imager on the MPG/ESO 2.2-metre telescope at ESO’s La Silla Observatory in Chile. It is one of the sharpest images showing the entire nebula and not only reveals its full size but also retains fine detail throughout the cosmic landscape of gas clouds, dust and newborn stars. 16 September 2015: The Sculptor Dwarf Galaxy, pictured in this new image from the Wide Field Imager camera, installed on the 2.2-metre MPG/ESO telescope at ESO’s La Silla Observatory, is a close neighbour of our galaxy, the Milky Way. 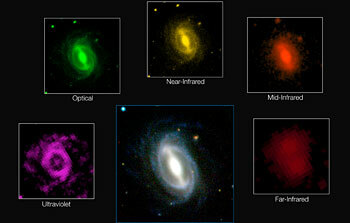 Despite their close proximity, both galaxies have very distinct histories and characters. 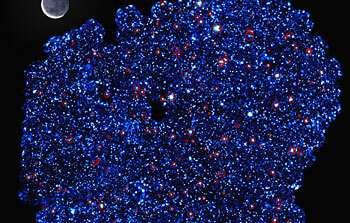 This galaxy is much smaller and older than the Milky Way, making it a valuable subject for studying both star and galaxy formation in the early Universe. However, due to its faintness, studying this object is no easy task. 2 September 2015: Dominating this image is part of the gigantic nebula Gum 56, illuminated by the hot bright young stars that were born within it. 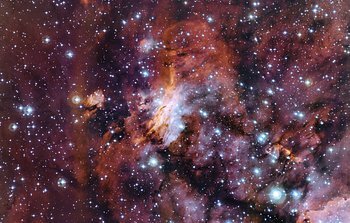 For millions of years stars have been created out of the gas in this nebula, material which is later returned to the stellar nursery when the aging stars either expel their material gently into space or eject it more dramatically as supernova explosions. This image was taken with the MPG/ESO 2.2-metre telescope at the La Silla Observatory in Chile as part of ESO’s Cosmic Gems programme. 19 August 2015: Open star clusters like the one seen here are not just perfect subjects for pretty pictures. 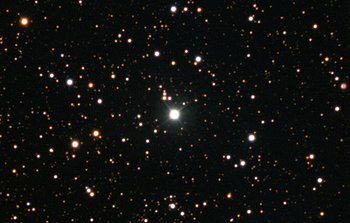 Most stars form within clusters and these clusters can be used by astronomers as laboratories to study how stars evolve and die. 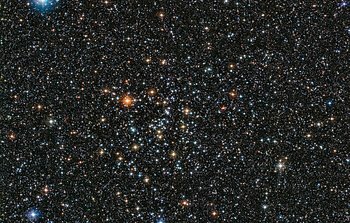 The cluster captured here by the Wide Field Imager (WFI) at ESO’s La Silla Observatory is known as IC 4651, and the stars born within it now display a wide variety of characteristics. 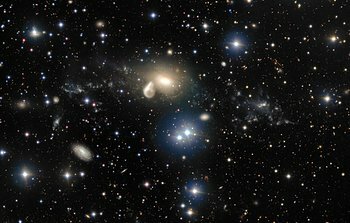 10 August 2015: An international team of astronomers studying more than 200 000 galaxies has measured the energy generated within a large portion of space more precisely than ever before. This represents the most comprehensive assessment of the energy output of the nearby Universe. They confirm that the energy produced in a section of the Universe today is only about half what it was two billion years ago and find that this fading is occurring across all wavelengths from the ultraviolet to the far infrared. The Universe is slowly dying. 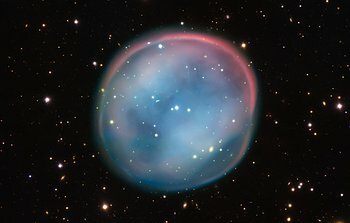 5 August 2015: This extraordinary bubble, glowing like the ghost of a star in the haunting darkness of space, may appear supernatural and mysterious, but it is a familiar astronomical object: a planetary nebula, the remnants of a dying star. This is the best view of the little-known object ESO 378-1 yet obtained and was captured by ESO's Very Large Telescope in northern Chile. 29 July 2015: The chemical element lithium has been found for the first time in material ejected by a nova. Observations of Nova Centauri 2013 made using telescopes at ESO’s La Silla Observatory, and near Santiago in Chile, help to explain the mystery of why many young stars seem to have more of this chemical element than expected. This new finding fills in a long-missing piece in the puzzle representing our galaxy’s chemical evolution, and is a big step forward for astronomers trying to understand the amounts of different chemical elements in stars in the Milky Way. 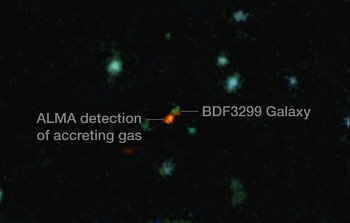 22 July 2015: The Atacama Large Millimeter/submillimeter Array (ALMA) has been used to detect the most distant clouds of star-forming gas yet found in normal galaxies in the early Universe. The new observations allow astronomers to start to see how the first galaxies were built up and how they cleared the cosmic fog during the era of reionisation. 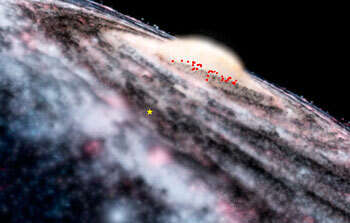 This is the first time that such galaxies are seen as more than just faint blobs.